I am delighted with the website Melinda Dean designed and built for me – it was such an unexpectedly easy process and I feel both as though I have a product that I absolutely love and the tools to work on it myself, adding to it as need arises. Min’s instructions are detailed and clear and she’s always been prompt at answering any queries. Her original brief was to work with some design elements that were already in place and she’s done that beautifully, transforming an ‘in- construction’ website (which had been in construction for some years!) into a professional site which reflects both my personality and my work. I’d heartily recommend Min Dean – fabulous communication, design flair and reasonable rates – what more can you ask for? Catherine approached me at the recommendation of two of my other author clients; Isobelle Carmody and Liliana Stafford. She was wanting a revamp of her existing site, which her daughter had built for her many years ago but who was now too busy to maintain on her behalf. She wanted to be able to feature her books, reviews and events and to have a blog, and basically make her online presence more professional, yet personal. Catty most of all wanted to express a sense of fun in her website, which is present in all of her work. Catherine sent me some assets and once I got a feel for her work, the design came together very easily. I came up with the her brand, based on a stamp that she owns and provided photos of, and fashioned it into what I hope comes off as a bookmark (Catherine picked up on this straight away, so it seems to do the trick!). We used WordPress so that Catherine would easily be able to add blog posts and manage all of the pages, content and images on her site herself. There are several customisations in the WordPress admin which allow for particular fields to become available only on particular pages, so as not to confuse the administrator/s. For example, the Awards and Reviews fields only become visible if you select that the page you are editing is using the Book template, as that is the only type of page those fields will become relevant on. 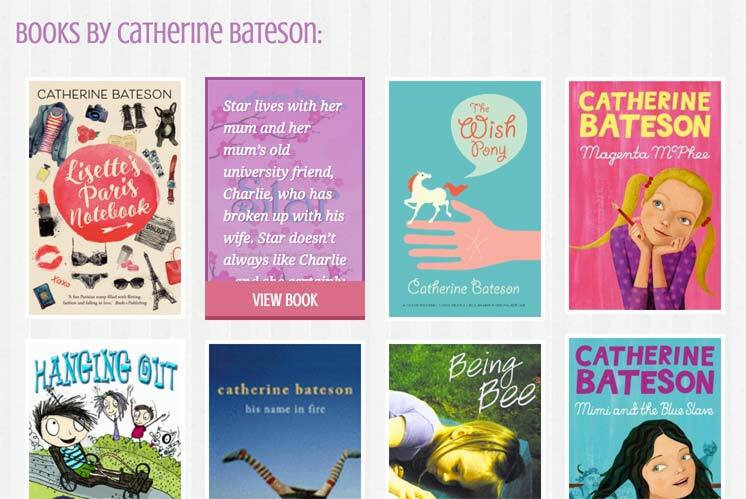 Books are of course, the main feature for an author, and Catherine’s website showcases her books in several ways. 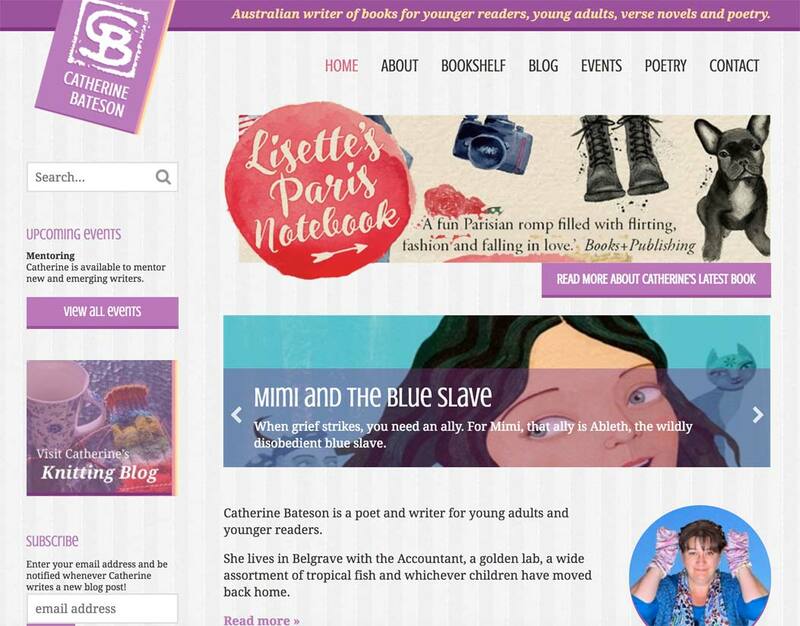 Firstly there’s a carousel in the footer – meaning that it appears on every page – displaying the bright and fun covers of Catherine’s books. When a user clicks through to any of them, they are taken through to that specific book’s information page. There’s a customised, masonry-style bookshelf that upon hover of any of the covers, previews a little of the blurb. Each individual book page contains a number of custom fields. Catherine can add a synopsis, publication information, where to buy info, a cover (of course) and supporting images in a gallery, awards, reviews, and more. For the Writing Miscellany blog, I’ve also added the option for Catherine to sell her books online, using a simple-to-configure one-click Paypal button. Catherine is a lovely client to work with, and we’ve expanded on the original site a couple of times now – adding more functionality as Catty has required it. We’ve implemented a subscription service, whereby a user can submit their email address in the sidebar, and any time Catherine publishes a new blog post, the users on that list are emailed about it automatically. 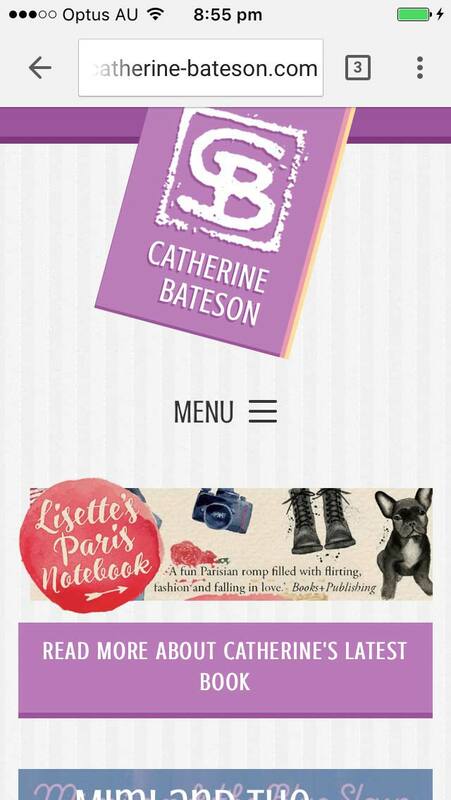 I’ve also implemented a special feature banner (currently featuring Catherine’s latest book, Lisette’s Paris Notebook, whereby Catherine can upload an image and specify a call-to-action link/page, and the banner will display on the top of every page of the website, as a nice little promo piece. Most recently, I created a sub-domain for Catherine’s mature content, A Writing Miscellany. Budget was tight on this project, so to save time and money, we agreed to create the new website basing it on the existing theme, making branding and colour adjustments to give the new site it’s own personality. 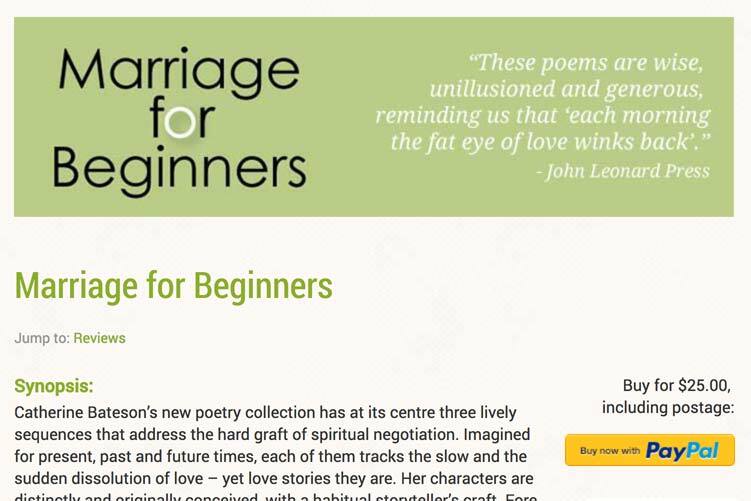 All in all Catherine-Bateson.com is a lovely little site which is fast and most importantly, the client loves it. And when a client loves their site, they love using their site, and everybody is happy. One of the nicest builds I’ve taken part of this year! Website homepage; fun and engaging, reflecting Catherine's personality. Book shelf layout; hover over a book cover and a hint of the synopsis appears overlaid; click through to read all about the book. Fully responsive; this is the same website viewed on a handheld device. Blog and subscription service for users who wish to be alerted (automatically) whenever Catty posts a new blog article. Feature banner, configurable by client which features on every page. Books carousel menu in the footer; a direct link to any of Catty's books from any page. Simple Paypal button available if Catherine wishes to sell her books directly to her users (A Writing Miscellany sub-domain).